The very first protected bike lane in Kansas was installed earlier this year in Manhattan, on North Manhattan Avenue between Moro Street and Bluemont. It’s a very short section, perhaps 150 feet or so, and it runs on the east side of North Manhattan Avenue, heading north. North Manhattan Avenue is a one-way street, headed south. The contraflow bike lane is protected by parked cars, and provides a way for bicyclists to travel north on this street without resorting to salmoning or sidewalk riding in a busy pedestrian district. 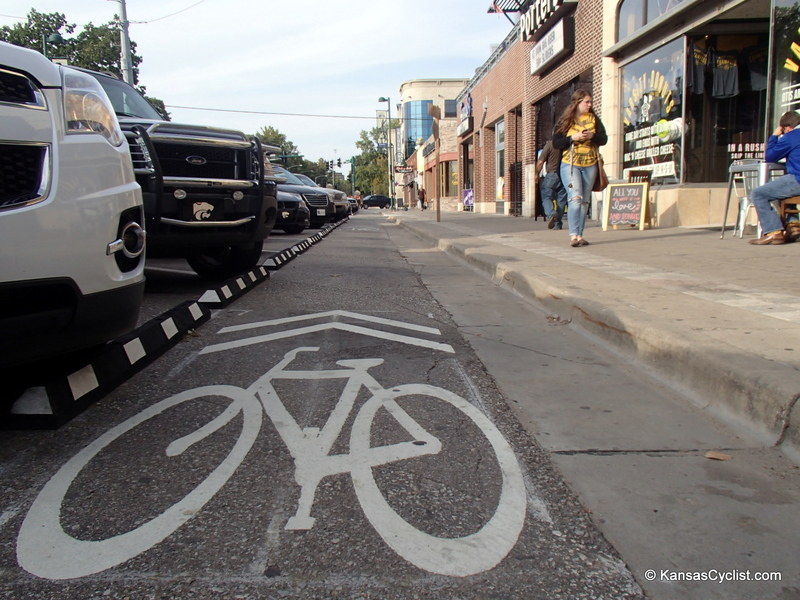 Incidentally, the “sharrow” (or “Shared Lane Markings”) used to denote this protected bike lane appear to be wrong. In this example, the sharrow is placed too close to the curb. If a bicyclist were to ride over the point of the arrow, as is intended, they’d crash into the vehicle! Likewise, on the Moro Street Bicycle Boulevard, the sharrow is too close to the edge of the roadway. 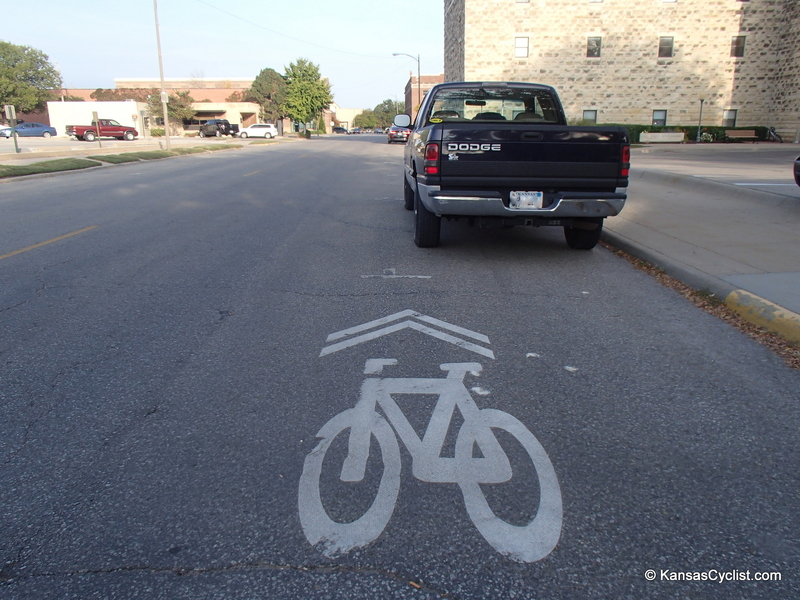 Here, a sharrow is half-covered by a parked trailer. Another issue with this location is that there should be a sign that says “Except Bicycles” beneath the “Do Not Enter” sign. 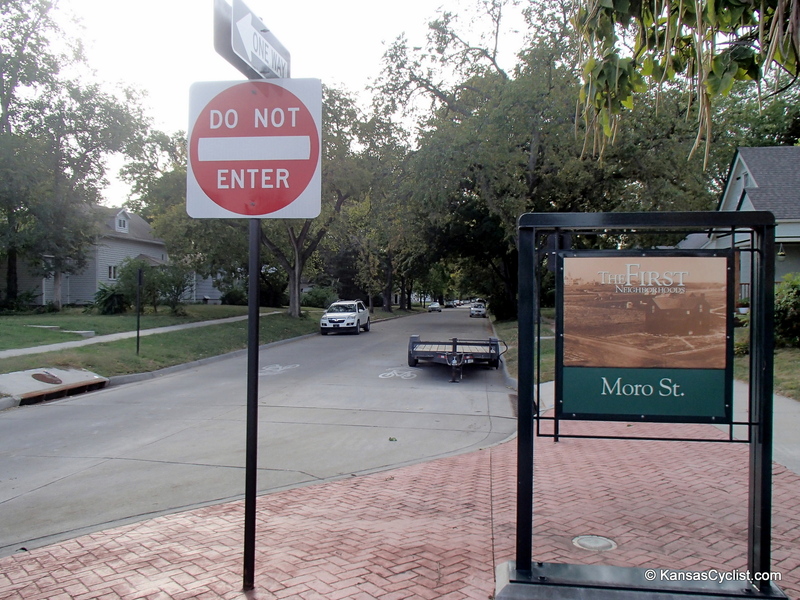 This is intended to be a one-way street for motor vehicle traffic, but a two-way street for bicycle traffic. Still, while we might wish that Manhattan would begin to place sharrows properly (and fix the ones that have been incorrectly installed), it’s good to see that the city is willing to be on the leading edge of bicycle infrastructure design in Kansas.